September | 2014 | We've Got Some Issues. 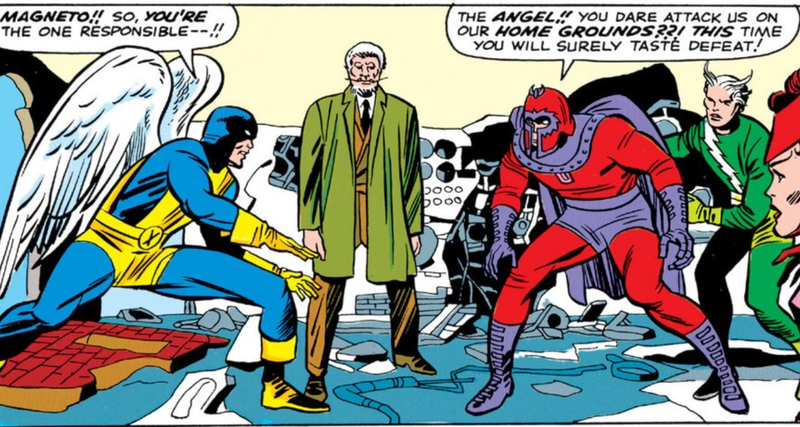 The X-Men and Magneto are both made aware of a new mutant. The X-Men or Magneto reach new mutant and begin seduction. Seduction goes awry for either The X-Men, Magneto, or both, and lively battle ensues. It’s as if Lee and Kirby, aware that fatigue is creeping into the bones here, are now beginning to dial open the telescope of these X-Books and aim it starward. The curtains open on the X-Mansion where Xavier is subbing a new “radar-image beam” for the Cerebro machine (a theory on the reason for this later). 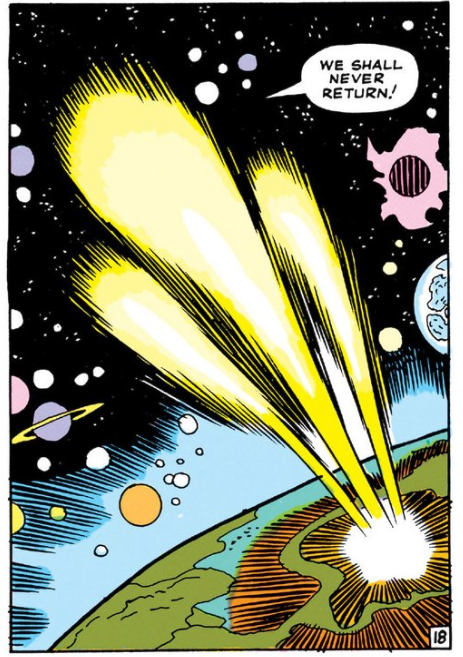 The radar beam is supposed to produce a hologram (or something) of whatever new mutant they’re about to locate. However, the “power” of this new mutant is too X-Orbitant to be reproduced in this flickering column of light. Xavier and Scott get a little alarmist about this. Relax guys, you’re superheroes. And hasn’t this pretty much always been the case? Magneto, Sub-Mariner, Unus, have all kinda been tagged as “the most dangerous mutant” the X-Men have ever faced, and things have worked out okay so far. Elsewhere, an antebellum south plantation owner is renting a room from Barbara Bush. The land lady privately observes that this stranger is the weirdest of the “weirdos” to whom she’s rented rooms, but he quickly soothes her nerves by handing her a cash bouquet. This unnamed “Stranger” clearly has little idea how modern life works. He walks out into NYC and observes that the city is far too cluttered, crowded and noisome, so naturally he decides to levitate above the crowd and walk on air. So, no, he’s not that good at blending in. 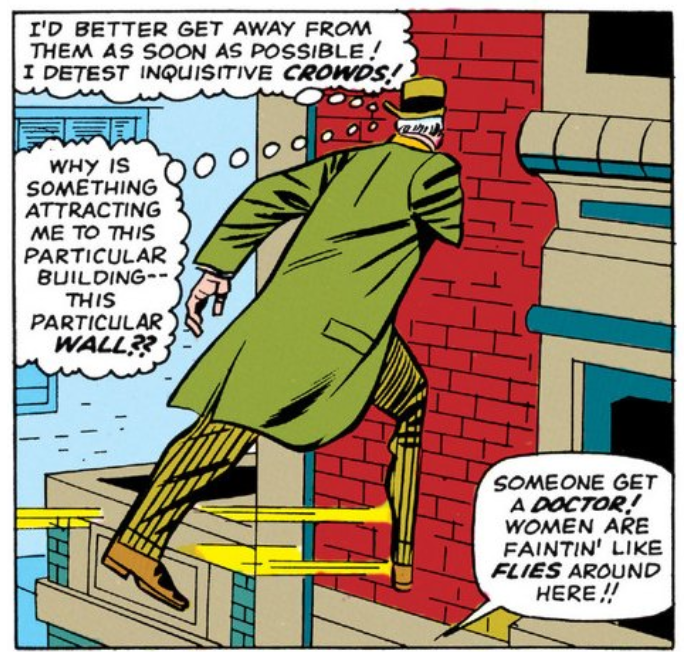 Rattled by the attention this draws him, the Stranger finds himself Shadowcatting into a building’s second story. Nearby, the X-Men are out canvasing the neighborhood for their new mutant. Angel, the natural scout of the group, is flitting above the towers dialoguing with bewildered window cleaners, while Scott (in his most suspicious “I am here to steal children” trench coat and slouch hat) gets approached by some cops. Displaying the keenest powers of policework, the cops note that lasers fire from Scott’s eyes, destroying their guns, a fire hydrant, and some sidewalk. Beast arrives in full costume to lift Scott up by his shoulders and soon the two are off bounding over rooftops to escape the scene they’ve caused. Sycophantic Mastermind jumps into the act and begins showing off. He casts illusions placing the Stranger into the depths of the ocean, then inside a volcano. With tactics like these, it seems clear why the Brotherhood hasn’t successfully added a member in nearly a dozen issues. 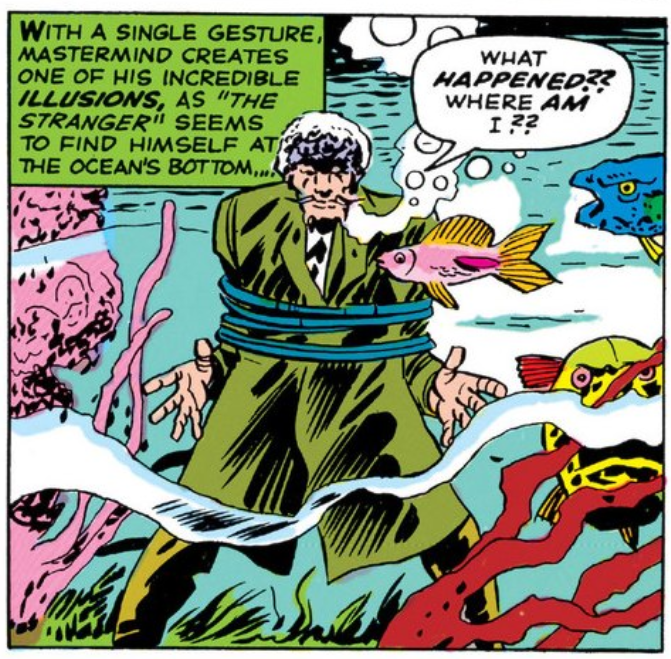 But then, more marvelously, the Stranger delivers a particularly derisive blow to Mastermind by transforming him into a pillar of stone. All this commotion alerts the (conveniently) nearby X-Men who come a-running. The battle is pretty rote, but the dialogue is hilarious. Magneto: This time you will surely taste defeat! Angel: Maybe so—but I’ll make sure that you taste it with me! Quicksilver: Uhh! His flapping wing unexpectedly deflected my blow! Scarlett Witch: Ice!! Forming on Pietro’s body—No! No!! Scott tries to talk them into joining the X-Men, “I always felt you didn’t belong with his evil band of mutants!” but they decline and determine to return to their “home in central Europe” where they will become street buskers or terrorists probably. The reader then rejoins the Stranger’s cyclone spinning alone in the woods. “We have journeyed far enough! 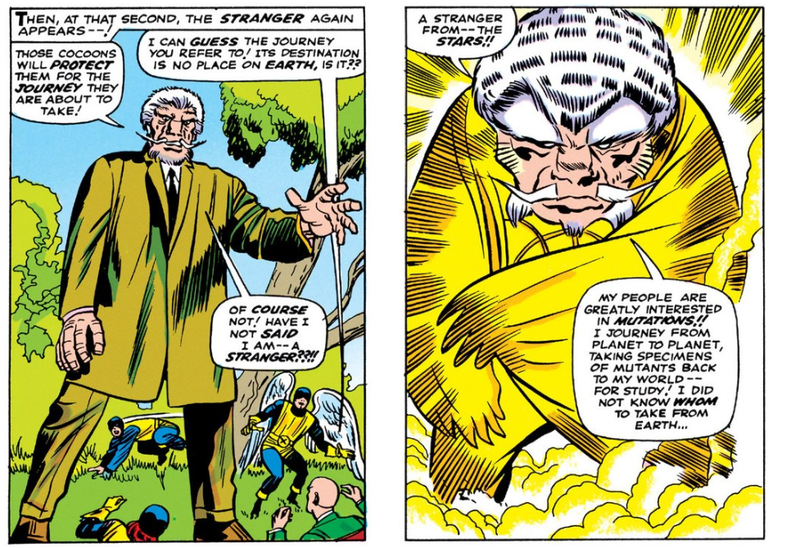 Prepare for dissolvement!” The Stranger adopts a challenger’s posture and begins tough-talking Magneto and Toad. The Stranger has a bottomless trunk of powers it seems. So far we’ve seen him levitate, shoot power blasts, change his size à la Giant Man, conjure insane cyclones à la Lucifer, and now, generate films of “anti-magnetic-membrane” à la the gods from the machine. So, what are his powers? They’re anything. Because this is their book, The X-Men show up, but to little result. 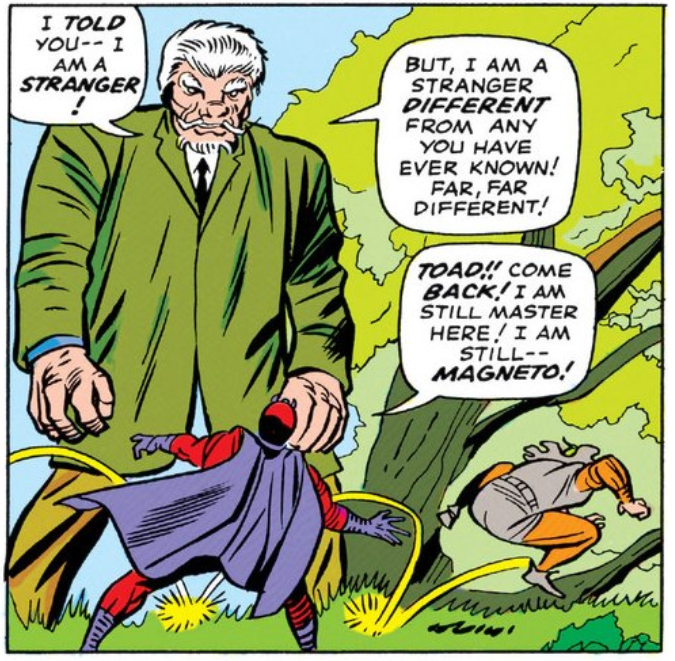 Our heroes can do nothing but stand there open-mouthed while The Stranger gets stranger by revealing his cosmic nature and absconding spectacularly with Magneto and Toad. So, the Brotherhood—it seems—is broken. 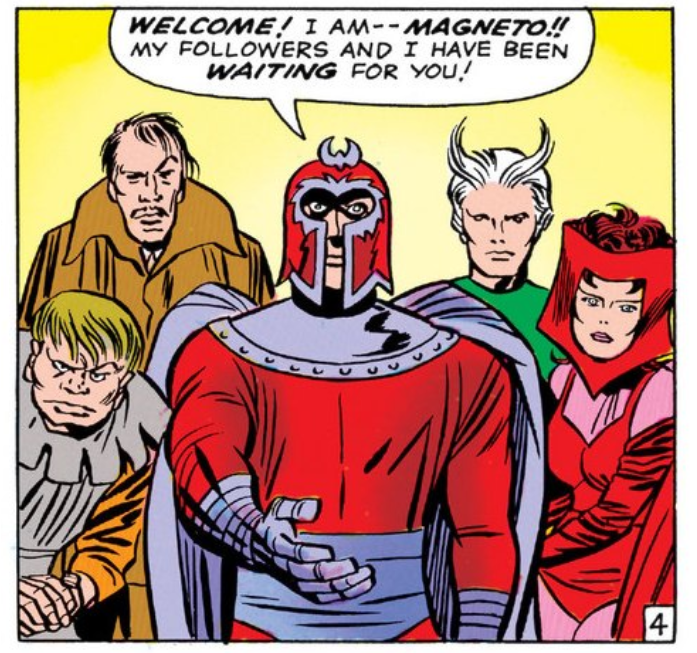 The Scarlett Witch and Quicksilver have retired, The Mastermind has been atomically reshuffled into a mineral, and Magneto and Toad have been captured and taken off-world by some kind of space god. 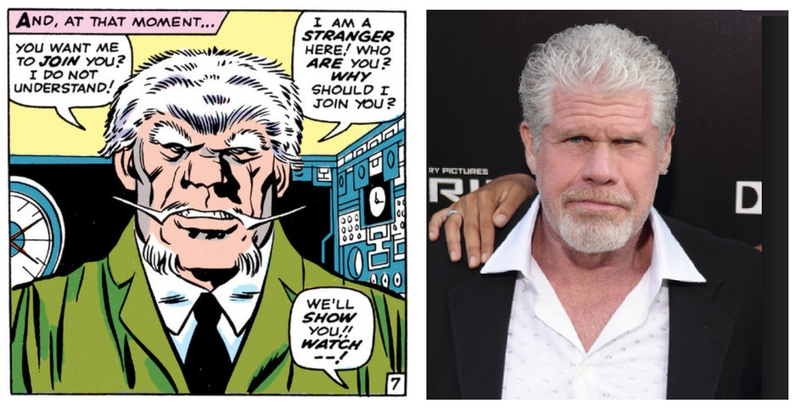 Where does this leave the X-Men? Right back where they started, in Westchester, sitting at their Cerebro machine, pulling the lever like old ladies at slot machines. 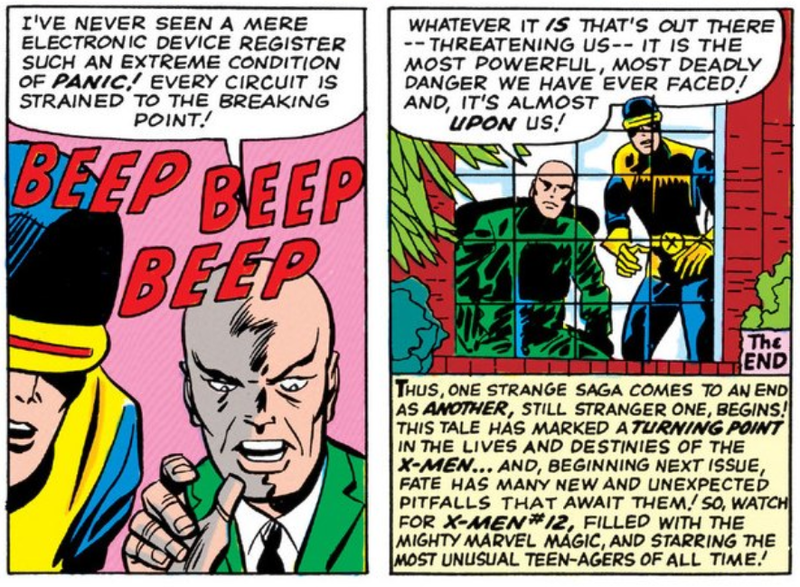 As always, the next mutant they’re about to face promises to be “the most powerful” they’ve ever encountered. So what was The Stranger? 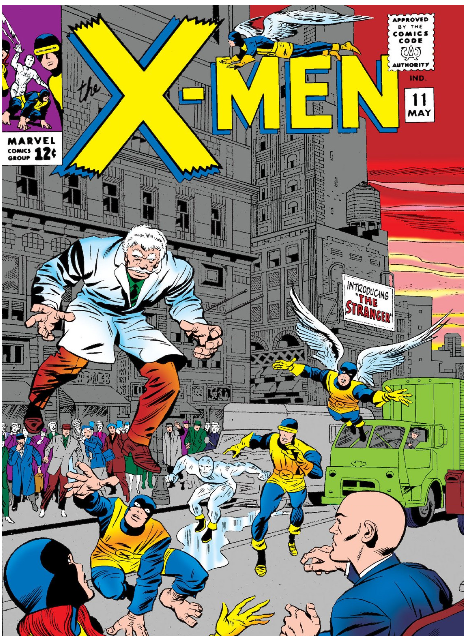 Not a mutant, which this reviewer believes to be the reason for the substitution of Cerebro with the nonsensical “radar-image-beam” (because Cerebro only locates mutants *stares coldly at self in mirror*). Doesn’t matter. One gets the sense that these are microscopic steps or at least impulsive gestures toward a coming world out there that can go deeper and mean more than just the heretofore normative mutant on mutant violence. Bring on the space gods. This deep into the series, there’s something missing. The art, character design, and vivacity of story is kind of immaculate. Jack Kirby’s biography has fallen on the sympathetic side of history, which, when combined with the pure, crackling festival of his artwork, makes his contributions to the X-Books pretty invulnerable. Stan Lee’s hilarious spiritual imprint buzzes hard throughout every panel. These comic books are, unquestionably, fun. But there is a very visible weakness in the armor. After eleven issues,—all the amusement and mania aside—there’s a notable deficiency of character here. 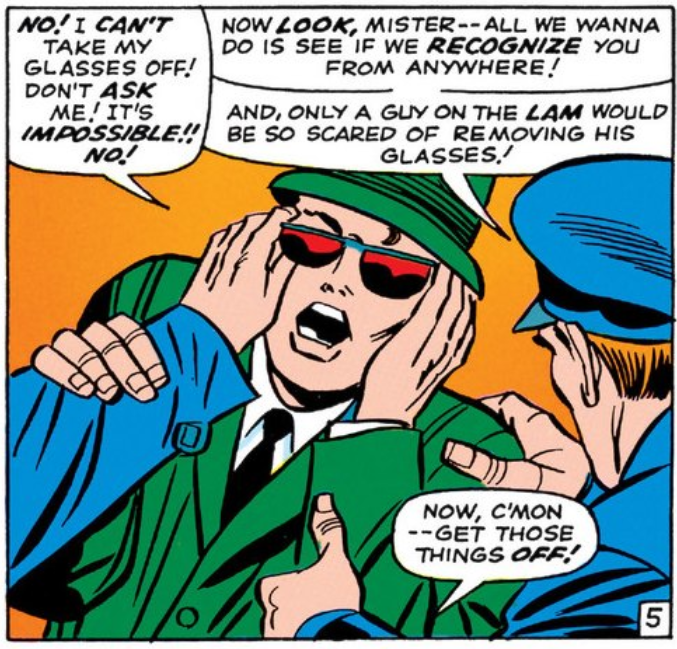 What characterization we do get, we peel from dialogue and thought bubbles, but it isn’t much: Beast is a wordy bookworm, Ice Man a prank artist, Cyclops a worrywart, and Xavier himself is kind of overbearing and tough to take. But that’s it. We don’t know anything about Jean except that she harbors a secret crush for Cyclops. We know even less about Angel. 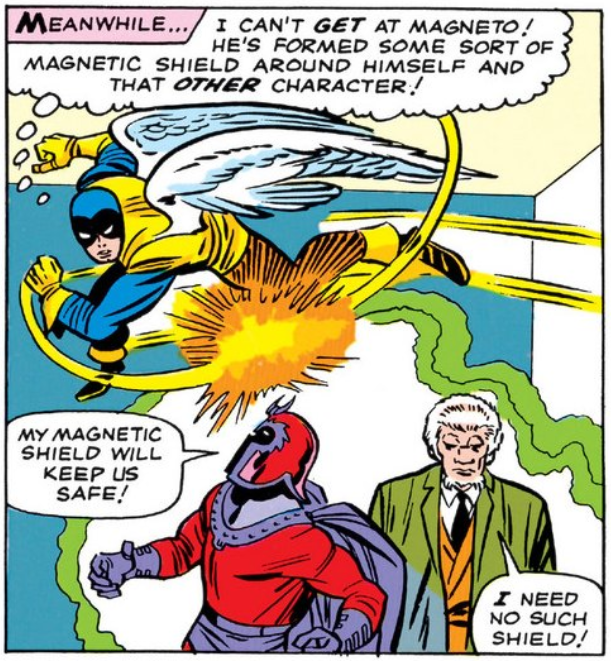 And all that can be said about Magneto is that he’s evil (it’s even in the title of his team). You, reader, may now be shouting: This is a comic book for children in 1965! Correct. It’s not fair to judge these early issues against the staggering legacy they are about to engender. But it’s worth noting that the precision of character that we applaud in other books, films, art of any kind, is totally absent here. At least so far. Today, the X-Men are popularly recognized as a more sophisticated alternative to other super groups (take your pick). But here, in its seeding-era, one can clearly see the distance it will have to travel to claim that crown.